The game features a guitar-shaped controller (resembling a miniature Gibson SG) that the player uses to simulate playing rock music. The gameplay is similar to GuitarFreaks, in that the player presses buttons on the guitar controller in time with musical notes that scroll on the game screen. The game features covers of 30 popular rock songs spanning five decades of rock, from the 1960s up through 2005, in addition to bonus tracks. 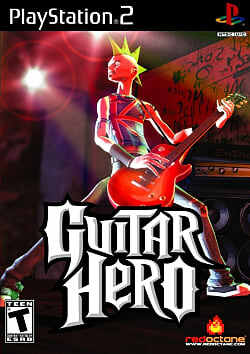 Guitar Hero became a surprise hit, earning critical acclaim and winning many awards from major video game publications, and was considered one of the most influential games of the first decade of the 21st century. Dynasty Warriors isn't the only series which has great potential in an open world setting. In need of a good laugh? Why not hear about ten of the stupidest video game lawsuits that have ever occurred in the industry? Youtube video reveals details of cancelled MMO Hero World that would have connected the Guitar Hero franchise. Want some suggestions for games to play with your grandkids, or games to entice your grandparents to play? Look no further! I got a chance to have a talk with renowned achievement hunter, YouTuber and all round great guy Patrick Maka, aka Maka91! Youtuber GuitarHeroFailure redoes perfect score of "Bark at the Moon" after copyright violation. Looking for a challenge, or a way to mix up your favorite game? Try a challenge run! Here are a few worth considering! All the details we know about Rock Band 4 and Guitar Hero Live are here. Who's going to win? Sometimes it's better to wait for a sale. The Top 10 list that should be easy turns out is very difficult, and I look into why this is. There's a HUGE market for modified controllers. Check out these top five controller mods and find out why. Women are close to matching men in gamer population because of the innovations taking place in the industry, but there's still room for growth. Everyone loves a terrible song from their favorite game they just don't always share it publicly on the internet. With a tear in its infamous giant eye-ball, Neversoft closes its doors to merge with Call of Duty makers Infinity Ward. Even more of the best boss fights, 80 - 71. Pretty straight forward; A list of games I feel were the best last gen had to offer. No one has reviewed Guitar Hero yet! Played Guitar Hero yet? What did you think?